Unlike most stone tools, stone hammers have the same durability regardless of the type of stone used to make them. Stone Hammers can only be crafted with a stick as the handle. Knapping out the Hammer Head. Metal Hammers can only be made from tool metals. They can be cast in ceramic molds, or worked on a metal anvil. Bismuth Bronze, Black Bronze, Bronze, and Copper Hammers can be cast using a Vessel or a Ceramic Mold instead of working on an anvil. Place an empty or partially filled Hammer mold into the slot to fill it with metal from the vessel. It takes 100 units of metal to completely fill an empty Ceramic Mold. The text in the vessel's GUI will be updated to show the amount of metal remaining in the vessel. Put the ceramic Hammer mold in the second input slot and wait for the filled mold to finished. Hammer Heads can also be crafted by using ingots on an anvil with a hammer. This is the only option for higher tier metals that cannot be cast. The durability depends both on the metal used and the skill of the smith forging the tool. Hammers are used to work metals on an anvil, smash Flux-stone and Borax to create flux, and in combination with the chisel to detail, smooth, slab and stair blocks (Both the hammer and the chisel must be in the hotbar. When using the hammer with the chisel, it does not take damage, unlike with the chisel). Hammers may also be used to break logs, yielding 1-3 sticks, and to create Stone Anvils by right-clicking on the top side of a Raw Igneous Stone block. 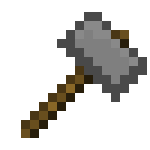 While the hammer is not technically a weapon, it can be used to deal crushing damage at the cost of using twice the durability per hit, making it the only stone-age tool that is effective against skeletons. After turning the raw stone into a stone anvil, the hammer must be placed inside to keep the block from reverting back into raw stone. Make a stone anvil Paleolithic! Right click with a hammer on top of a raw igneous stone block. Stone hammers use cobble instead of raw stone. Added creating of flux from flux-stone and hammer. Flux can be processed from borax using a Stone Hammer, however the hammer will be lost in the process. Added Stone Masonry which requires a chisel and a hammer. Stone tools are made via knapping. Stone anvils are made by right clicking on the top of a raw stone block with a hammer. Stone anvils render the hammer icon on the surface. Added smashing a log in the world using a hammer to get sticks. Hammers deal crushing damage, a valid choice against early skeletons. This page was last modified on 8 October 2014, at 01:15.